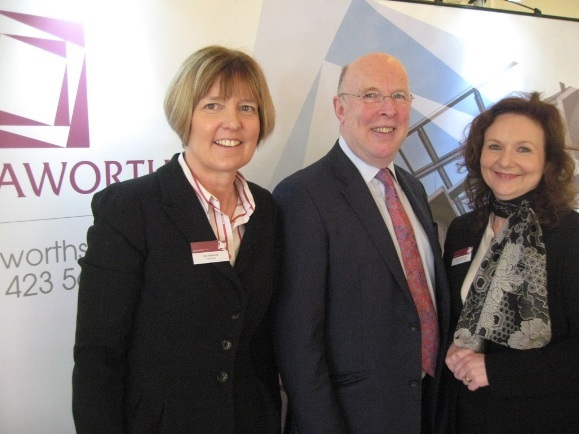 Stormy weather and indeed weather of all sorts was the subject of the recent Raworths Breakfast Club event held at Bettys in Harrogate. Dr John Hirst CBE, who was until September 2014 chief executive of the Met Office, was the keynote speaker at the event. The Met Office is one of the UK’s top 20 online brands and John Hirst’s talk covered both the science and skills of forecasting the weather and predicting changes in the climate and how service that is a world leader can be used by the wider business community. The influence of the Met Office on our lives is truly far-reaching – from event planning to preparation for military action in the Middle East, from how weather effects our major supermarkets in terms of stocking their shelves to how flood frequency influences drainage planning as well as insurance; all are effected by advance knowledge of accurate weather prediction by the Met Office. Rachel Tunnicliffe, head of Trusts, Wills and Estates who joined Raworths last year also spoke on planning for storms in business and family life with special emphasis on setting stratagems and agreements in place before unexpected events make legal action the only option. Rachel’s team at Raworths is now the largest in the firm and the major specialist Trusts, Wills and Estates team in the area. Over 40 guests attended the event in Bettys’ Imperial Tea Rooms. The next Raworths’ event will be the bi-annual Employment Update which will take place on 18th March and will cover the latest round of changes in employment legislation.